Thousand of comic book fans jumped up and down after seeing the preview cover for Brightest Day #2 that showed that Aquaman would return to the land of the living after Blackest Night was over. Then in Blackest Night #8, Arthur Curry was brought back to life, hand and all and reunited with his wife, Mera. Though the cost was high, as Garth, better known as Arthur’s adoptive son, Tempest would not be so fortunate. As well as Arthur and Mera’s own son along with the original Aquagirl, Tula and Dolphin. Closing a large chunk of Teen Titans’ history and repairing Aquaman and Mera for a new era and direction. For many of us, having the original Aquaman back makes a lot of us do the happy dance, including my brother-in-law and my two nephews who have been fans of the character for years. However, with his return comes a bit of fear we all hope to let go off in the year ahead. The character drifted so much (no pun intended) until Peter David decided to dramatically change the character’s direction and attitude in the early 90s. Giving him a very Conan look and losing his left hand and having it replaced by a hook. While, dramatic and cool at first, as the years went on. 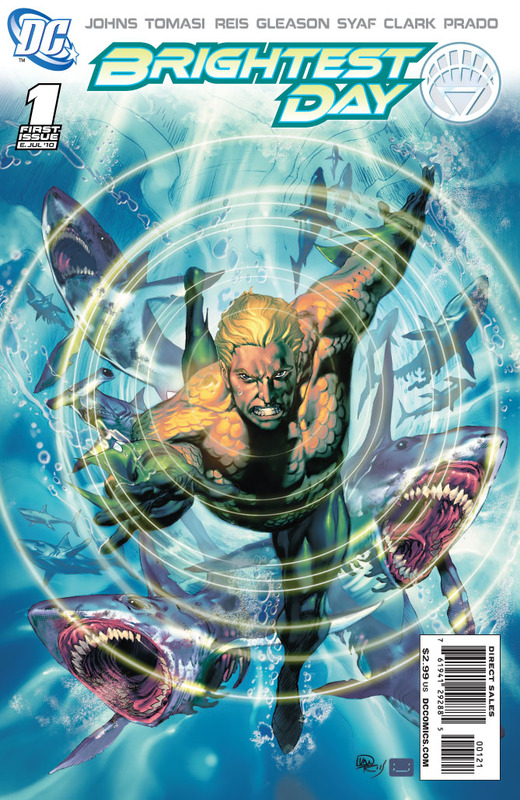 Aquaman became very one note as his book went through writing and artistic changes and soon the title came to an end. Leaving Aquaman to be “killed off” time and time again. Only for him to return in some new direction that really didn’t go very far. The biggest move was giving him a new under water city to protect, a magically enchanted water hand (long story) and returning him to happier days. However, then once again, it wasn’t enough so they mutated the character and brought in a completely new character to be Aquaman. While writer, Kurt Busiek did some wonderful stories and made me care about one of the side characters, King Shark. They then decided the best way was to just completely kill off Arthur and leave it there. With the “new” Aquaman now front and center, most of DC thought that this was the best way to get the character to replace the old once. Despite the fact that Tempest was around and was more of a worth inheritor of the mantle of Aquaman. As we all know that just didn’t work and Tempest starting to get the same treatment in stories as his predecessor got. Now, thanks to Brightest Day, we have the original back and have lost most of his family in the process. I’m a bit wary and I hope we have Arthur reclaim his lost fame that he got back in a way 20 years ago. He’s more than a guy who can talk to a fish; he’s a hero, a king, a dedicated husband and father. I don’t know about you but that makes a very well rounded character with a lot of history with any super hero in the DC Universe.